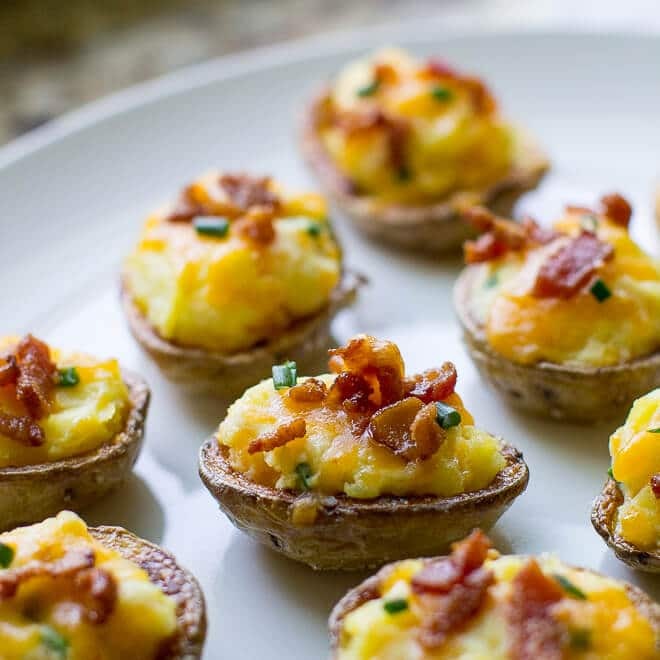 Mini Twice Baked Potato Skins are loaded with cheese and topped with bacon. The small size makes them a kid favorite, but adults will gobble them down too! I’ve always had an infatuation with Twice Baked Potatoes. Maybe it’s just that they taste so fantastic or because they are usually only served on special occasions. Well, I’m throwing that Special Occasions rule right out the window. Here’s a version – miniature and AWESOME – that you can make every week. Make these on Monday for after school snacks or Friday for watching TV for Sunday for football season. Which apparently is upon us now. Start off by cooking the baby potatoes in the microwave. It takes about 8 minutes, but that way they are cooked all the way through. Once they are cool enough to handle, cut them in half and scoop out the middle. Crisp up the skins in the oven with the help of some olive oil and salt. While those bake, mix up the twice baked potato filling of your dreams (or at least mine). 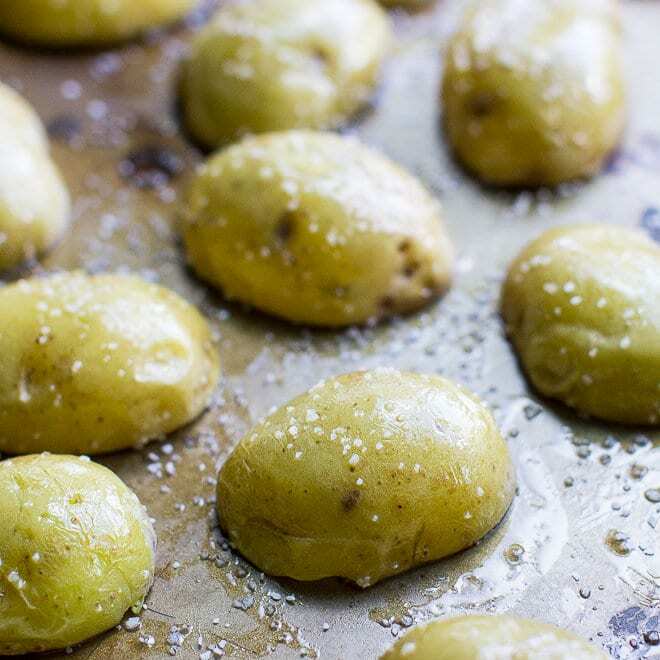 After about 10 minutes, stuff the tiny potatoes with your cheesy-chive filling and boil to bubbly and golden brown. Then –> Top with bacon. These potatoes are best served straight from the oven. You can scoop and assemble the potato filling in advance and prepare the skins. I recommend baking the skins and filling and broiling them as close to serving time as possible. By the way, are you having a pompous dinner party with a satirical menu of bite-sized foods? 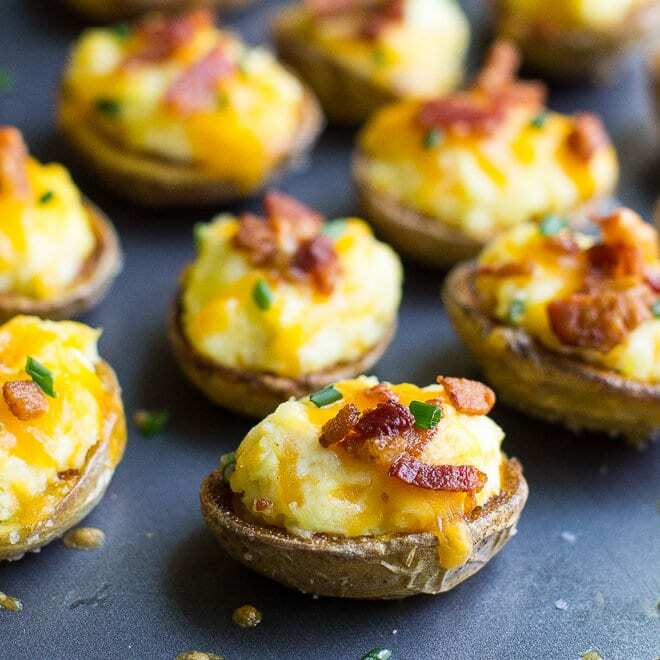 These Mini Twice Baked Potato Skins would be perfect. 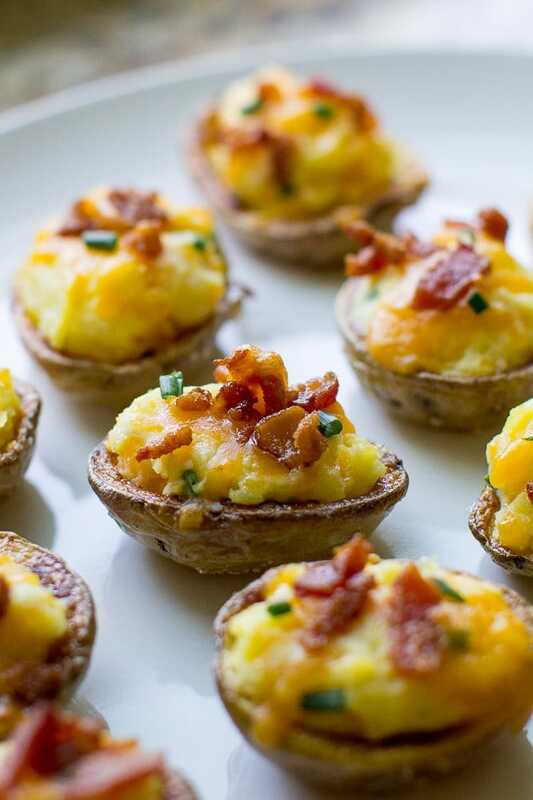 Save these Mini Twice Baked Potato Skins to your “Appetizers” Pinterest board! Preheat the oven to 450 degrees. Prick each potato a few times with a fork. Arrange the potatoes in a single layer on a microwave-safe plate lined with paper towels. Microwave on HIGH for 4 minutes. Turn the potatoes over and microwave for an additional 4 minutes on HIGH. Using an oven mitt or kitchen towel to handle the hot potatoes, halve each potato lengthwise and scoop out the middle into a medium bowl, leaving 1/4" layer of potato on the side of each skin. Arrange the potato halves cut side down (skin side up) on a baking sheet. Brush with olive oil and sprinkle liberally with salt. Bake for 10 minutes or until the skins are crispy. Remove from the oven and set oven to broil. Meanwhile, to the bowl with the scooped potato filling add cheese, sour cream, scallions, butter, 1 teaspoon salt, and 1/2 teaspoon pepper. Mix well. 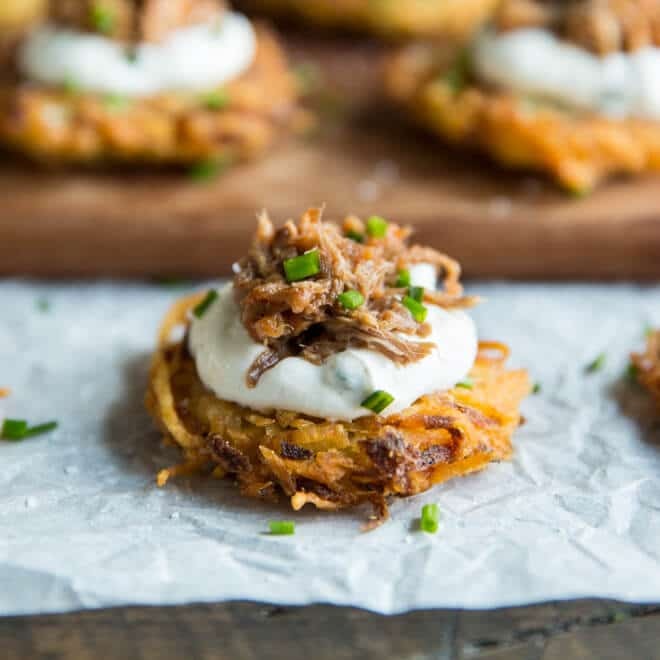 Divide the filling among the crisped potato skins. Return filled potato skins to the oven and broil until cheese is melted and bubbly. Remove from oven and top with bacon bits. Garnish with parsley if desired and serve warm. These disappeared immediately off the table. Kids, adults, you name it and everyone loved it! Any suggestion on a possible sour cream sub?